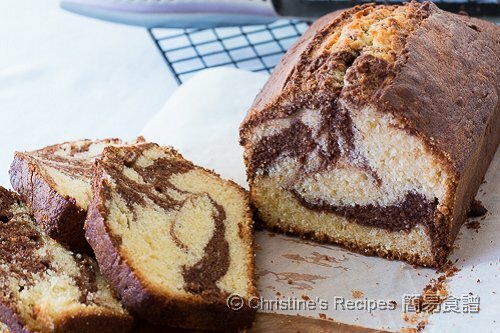 I’ve been quite into swirl marble cake recently. Previously, I’ve made a matcha marble chiffon cake. The swirling process is the fun part. 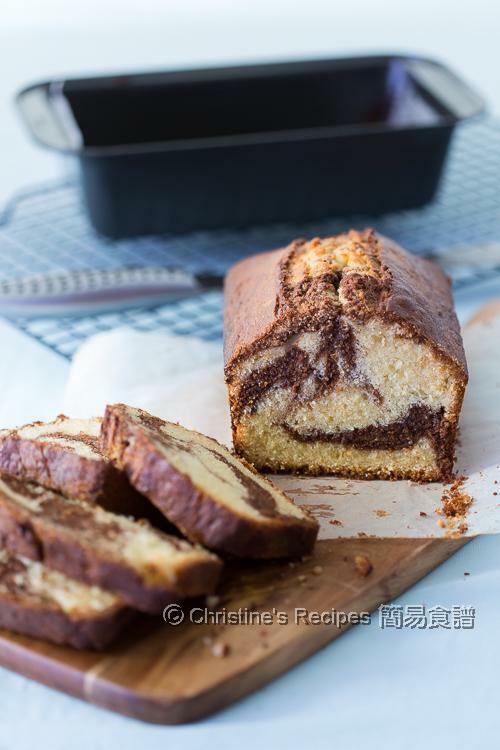 Each time I slice a swirl cake, my curiosity comes up quickly, wondering how the cake will look like inside. The outcome was great. Taste-wise, the slight bitterness of dark chocolate is just right to balance the sweetness of the whole cake. It’s perfect for tea. So I brought it along to join a gathering and shared with my friends. To prepare the chocolate sauce: Melt the dark chocolate with milk in a small saucepan, over medium heat. Set aside. Preheat oven to 180C / 356F. Line the baking pan with baking paper. Lightly beat the eggs. Drain through a fine sieve to remove the foam. Set aside. Sift the cake flour together with baking powder and salt. Beat the butter in a large bowl with an electric mixer at low speed until smooth. Add the sugar and beat at medium speed. Then increase to high speed and continue to beat until very pale and creamy. Add the beaten eggs, in 3 additions. Beat well after each addition. Beat in the vanilla extract. Sift in the flour mixture in 3 batches, and gently combine well. Between additions, lightly stir in the milk. Then you’ll get a smooth batter. Scrape down the sides of the bowl occasionally. 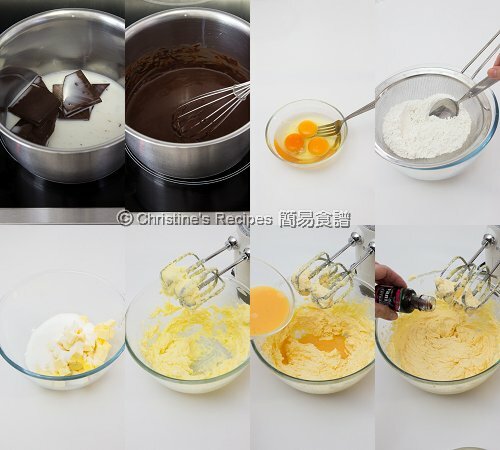 Divide the batter into 2 parts. Incorporate the chocolate sauce into one of them. 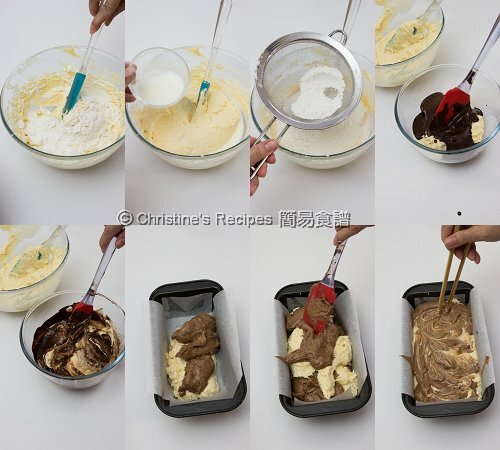 Alternatively, spoon two parts of mixture into the lined baking pan. 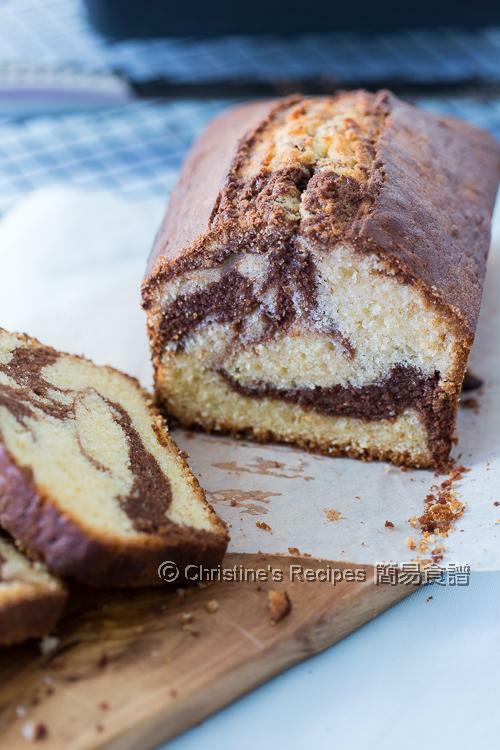 Use a pair of chopsticks or a knife to swirl the batter to create a marbled effect. Level the surface. (Please refer to the tutorial video above). Bake in the preheated oven, for about 20 minutes. When the sides start to set, remove the cake from the oven. Use a sharp knife to draw a line in the middle. Put it back into the oven. Reduce the oven temperature to 170C / 335F. Bake for another 20 to 25 minutes, until the cake turns golden brown. An inserted needle comes out clean. Remove the cake from the oven and let it cool on a wire rack for about 5 minutes. Remove the cake from the pan and let it cool completely on the wire rack. Enjoy! I used dark chocolate with 70% cocoa solids for a deeper flavour. You may use the one with 50% cocoa solids instead. Don’t swirl the two batters too hard or too long. Otherwise, you’ll get a chocolate cake. The swirls are so perfectly done, Christine. And the cake has a really smooth and light crumb. Buttermilk is ok. As buttermilk has a bit more of acid than milk, you might want to add a pinch of baking soda to balance it. I agree with Angie the marble swirling are perfect. Great texture too. Thanks for sharing, Christine. May i know what butter brand to use? I used Coles brand. You can use any brand that you like or comes in handy to you. Chris, for this recipe, can I used cocoa powder instead? BTW, baked the Pumpkin chiffon cake earlier, we loved it, vg,soft & very fine texture. Can I used olive oil instead of vegetable oil. Tks so much for sharing your recipes. Glad that you liked the pumpkin chiffon cake. Sure, olive oil can be used. Please use the light one as the aroma won't be too overpowering. As for this recipe, you may experiment with cocoa powder for sure. It'll work too. May I know what is the size of eggs used in this recipe? Thanks for sharing all your lovely recipes in your blog, they are wonderful! The size of my eggs was about 55 to 57 grams (egg white and egg yolk), medium. Hi christine, I just bake the cake today. It turns out well but my only concern is the dry texture when I swallow the cake. May I know why? The water absorption rate of every brand of flour is quite different. If you feel your cake a bit dry, then you might need to add a bit more of milk of water next time. Thanks for sharing this recipe. The cake is simply fantastic and I have made 3 times for my family members. Need your advice, is it ok to replace the caster sugar to brown sugar? Do I use the same 170gm of brown sugar too? Thanks much Christine. Brown sugar is ok and will bring more moist to the cake. You can use the same amount.